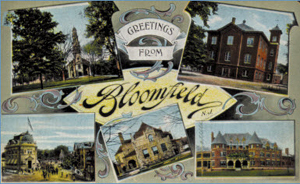 On this three mile hike, conducted by Ron Rice and Bloomfield Councilman, Rich Rockwell, we'll explore the path of the Morris Canal through Bloomfield using historic maps and photos, then take a bus ride for an additional 2 miles stopping at the newly reclaimed section of the canal at Oak Tree Lane. Space is limited - reservations are required. $5.00 donation requested to cover the cost of the bus and 20-page handout with historic photos and color maps. To reserve a space, email MorrisCanal@gmail.com. Looking north towards the Berkeley Avenue Bridge over the Morris Canal and Second River (to the right). Morris Canal Aqueduct over Second River near the Second River footbridge from Newark Avenue to Walnut Street. Former Erie Railroad Bridge over the Morris Canal. Near GSP southbound Exit 149.